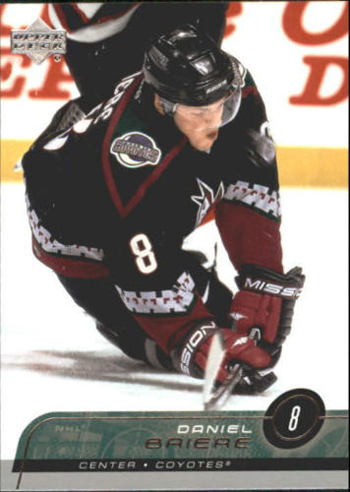 It’s Throwback Thursday so let’s go back through Upper Deck’s trading card history and come up with a fun giveaway. The 2014 NHL® Playoffs kicked off last night and the Montréal Canadiens had a thrilling Game 1 OT win over the Tampa Bay Lightning. Daniel Briére made a fantastic pass to teammate Dale Weise who scored the game winning goal. So let’s put up a throwback card and see if our fans can come up with some great captions for the card! Please share your comical caption to this card for your opportunity to score five (5) packs of 2013-14 NHL® Fleer Showcase! You have until Friday morning, April 18 at 8:00 a.m. PT to post your caption before this promotion is closed. Only the customer selected to receive the card packs will be contacted via email, so please make sure to provide an accurate email address when you leave your comment. Who says you need a slip and slide to have fun? I have a whole Hockey Arena to slide around and look good doing it!! Now that our season is over I am just going to lay down and take a nap. I practice this move all the time. I call it swing batter batter swing… on ice. That’s it, just touch the tip of that toungue to the ice and you get the $5. Congrats to Charles Ottley! Your laugh out loud comment this week scored you five (5) packs of 2013-14 NHL® Fleer Showcase! Thanks to everyone for participating and come back again next week!